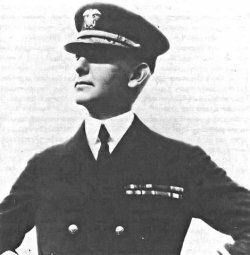 The Pacific War Online Encyclopedia: Bloch, Claude C.
Claude C. Bloch had graduated from the Naval Academy in time to serve in the Spanish-American War. He was commander of 14 Naval District, based at Honolulu, at the start of the Pacific War. He was a former commander, U.S. Fleet, and so was in rather an uncomfortable position serving under Kimmel, who had a tendency to interfere with Bloch's management of 14 Naval District. Bloch had rejected proposals to install antitorpedo nets in Pearl Harbor on the grounds that they would greatly delay a sortie of the fleet, but he was otherwise a preparedness advocate and was a principal witness at the various Pearl Harbor inquiries. Bloch was among the admirals who advised against carrier raids on the Mandates early in the war. (The raids took place anyway.) He retired a year after the attack on Pearl Harbor (he was 64 years old) but continued to serve on the Navy Board.